Well, while I'm waiting for all the new product I ordered, (wow, it's hard to wait, isn't it?) we'll take a look at an oldie but goodie, Bring on the Cake, for today's Ten Minute Tuesday. Simple and straightforward and takes just minutes to complete! 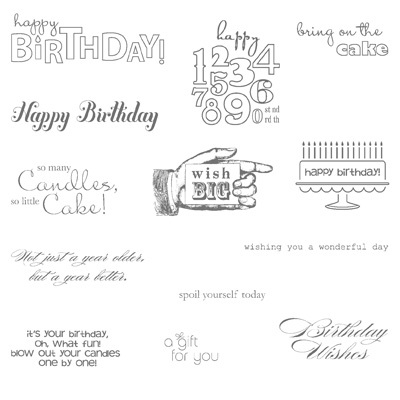 Bring on the Cake stamp set is full of fantastic birthday sentiments along with two images that can be used over and over again. It's like a perfect go-to stamp set! Created on a background card of Melon Mambo, I first stamped the cake images along the lower edge of Whisper White and then adhered it to the card front using Stampin' Dimensionals. I used a Basic Grey Stampin' Write Marker, so I could isolate just the cake for stamping without the "happy birthday". 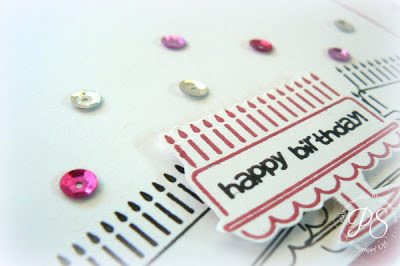 On a scrap of Whisper White, I also stamped the cake one more, this time in Melon Mambo and inked up the sentiment with a Basic Grey Stampin' Write Marker. 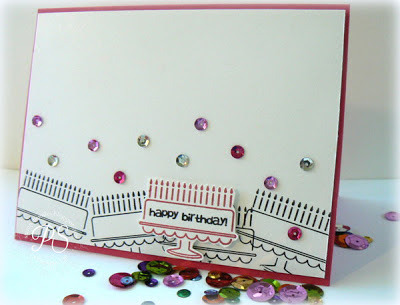 I fussy cut the cake, popped it on with a couple of Stampin' Dimensionals and adhered some pretty sequins on using Tombo Liquid Adhesive. I purchased the sequins from our local Hobby Lobby. Like way under ten minutes! Any line drawn stamp set works well for this technique.... flowers, butterflies, well, what do you have in your stock? Isolating parts of an image using Stampin' Write Markers allow you to use a stamp in a number of ways.... just looking at the cake stand as I write this I happen to see a sweet little set of waves (the scallop edge). What else can you see? such a cute card, love your work penny!